To understand how to customise error-handling messages, you first need to know about the Err object! 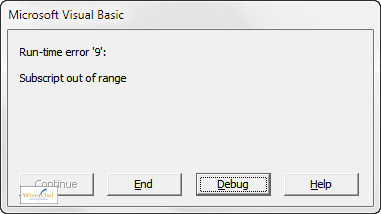 The Err object in VBA is created when an error occurs. It has two main properties: the Number of the error, and a Description of it. vbOKOnly + vbExclamation, "Wise Owl error"
The error message includes the built-in description, converted to upper case. I also find it useful to go into break mode using the Stop statement when developing, so I can see what went wrong. ShowError "No such worksheet as TESTSHEET"
Although it's not for the purist (none of this blog is! ), it works and is about as simple as you can get while still being effective. Resume Try repeating the line which made the routine crash. Resume Next Continue running the subroutine beginning with the line immediately following the one which made it crash. Const SheetName As String = "TestSheet"
Coding like this is just asking for trouble! 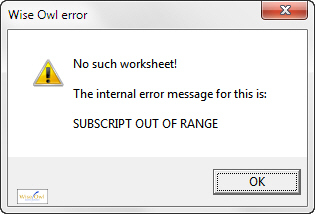 If your attempt to create a new worksheet doesn't work for whatever reason (and I can think of a few circumstances when it wouldn't) this macro will loop indefinitely. Having looked at the syntax of error-handling code, it's time now to consider a worked example.